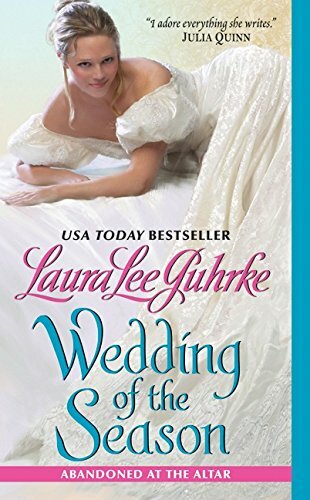 Wedding of the Season is not a part of Laura Lee Guhrke’s Girl-Bachelor series, but the start of the new Abandoned at the Altar series. Some of the characters from Girl-Bachelor do appear, but only as the plot requires, and Guhrke thankfully does not fall into that most common of romance traps: parading around previous characters to display their ongoing happiness. Like the characters in the Girl-Bachelor books, Wedding’s heroine Beatrix is unmarried, but as the daughter of an Earl, she occupies the upper echelon of society, and has not needed to seek employment to support herself. Further, she very much wants to be married, and begin the life she was raised to lead—one of land ownership, social responsibilities, good deeds, and the proliferation of aristocratic lines. She had thought to lead this life with Will, the proverbial boy-next-door, heir to a Dukedom, and the boy she’s loved since they were children; however, Will thwarts those plans by leaving to pursue his archaeological dreams in Egypt two weeks before the wedding, leaving her devastated and subject to gossip and conjecture. Six years later, she is finally over her childhood love, and engaged to a wonderful, kind, steady man who shares her values and has no interest in Egypt whatsoever. Her life is back on track, and she’s ready to face the future. Which only makes it that much more frustrating when she runs into Will—literally—back in England and very much the same. Beatrix and Will may as well be labeled “status quo” and “new world order.” Trix represents all the social customs and mores of the British aristocracy. She is concerned with chaperones and etiquette, social responsibility and practices. She has the weight of Britain’s history behind her, and she sees no reason to stray. Will, however, recognizes that the social hierarchy is failing. Estates no longer have the ability to sustain themselves, let alone townhouses, numerous servants, and a lavish, idle lifestyle. Though he is a duke, with all the power and status that the title conveys, he refuses to rest on the circumstances of his birth, and yearns to make a name (and a fortune) for himself by himself. This dichotomy is where the romantic tension in the story lies. Beatrix wants to hold on to the idyllic past (which, admittedly, has held for centuries), whereas Will is determined to go boldly into the future. Trix thinks Will is neglecting his responsibilities and abandoning his life and history, whereas Will thinks Trix is holding on to traditions that are not only over, but keeping her caged. There’s also the matter of Beatrix’s fiance, but really, he’s trivial to the greater story. The historical romance genre is powered on the Regency period. Yes, some stray into Georgian (though the social mores are quite close), and there are the occasional forays into the medieval era and the American Old West, but for the most part, when historical romance readers read, they read Regency. So when Guhrke introduced her new Girl-Bachelor series, set at the turn of the 20th century, it was a double-edged sword. On the one edge is the Regency burnout that a lot of historical readers experience, and the excitement of a new era, setting, and culture to explore. But dancing on the other edge is an unfamiliarity that will be, well, unfamiliar. After all, after reading hundreds—in some cases, er, thousands—of Regency romances, a reader will start to develop a certain intimacy with the period. Authors no longer have to explain the importance of an invitation to Almacks, or what a pelisse is, or why no self-respecting young woman would approach a gentleman without an introduction. But these shortcuts don’t exist in an unexplored time period, and most readers will find themselves in uncharted waters—both in terms of the setting, but also in terms of being in uncharted waters. This can create enormous hurdles for the author, who has to educate the reader on the cultural nuances of her chosen time period, without compromising an emotionally engaging story for didacticism. For the most part, Guhrke achieves this balance, but there are occasions when her setting gets away from her. Hard to say if it’s an author or an editor choice, but there is a lot of description in the novel, and a fair bit of repetition that can occasionally lead to the reader feeling as if they are being hit over the head with a “pay attention—this is a period-appropriate custom” stick. The result is that the setting becomes the most important character in the novel, and overshadows the romantic plot. This isn’t helped by the fact that the main conflict doesn’t change from the prologue to the conclusion. Will wants the future; Beatrix wants the past. Wash, rinse, repeat. Delight can be found, however, in the details of the new era: the fact that Beatrix drives a motorcar (complete with a driving coat and goggles) is a fun little clue that she’s not as mired in the past as might otherwise be suspected. The information about the excavations in Egypt and the thrill of the search goes a long way to explain Will’s actions. And the descriptions of women’s bathing costumes as the characters take a seaside vacation is enough to make me very happy I live in the 21st century. Delight can also be found in the strength of Guhrke’s writing, to which her fans can attest. The secondary characters are particularly enjoyable, and it appears as if two in particular are going to show up as main characters in the next book in this series. Innovative, nuanced, and just a little setting-heavy, Wedding of the Season is a book well worth reading—even if only to send the message to romance publishers that “historical” can (and should!) mean more than Regency romances.